By the end of World War Two there was a severe shortage of housing in Britain. Under the Housing (Temporary Accommodation) Act 1944, the Ministry of Works was to provide 500,000 ‘Emergency Factory Made’ (i.e. prefabricated) homes to tackle the shortage. In fact, only around 160,000 were built including a number of Swedish Baltic pine timber prefabricated, homes. 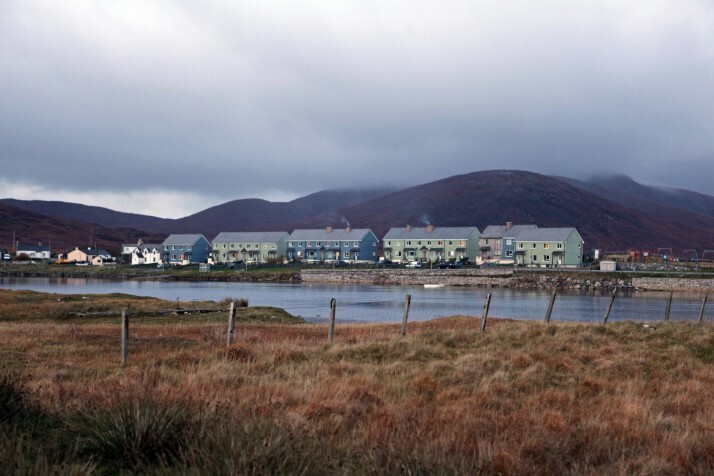 The memo reported that, “The problem of securing adequate housing in rural areas is causing grave concern to the Minister of Health, the Secretary of State for Scotland and the Minister of Agriculture. There is already an acute shortage, and this will be accentuated after the war as (a) the production of more live-stock and live-stock products, which will be necessary if agriculture is to help our foreign exchange position, will entail more labour, and (b) we shall want to train numbers of ex-Servicemen for agricultural and rural pursuits.”(1) The various types of prefab bungalows being planned/erected in urban areas were deemed to be both too temporary and unsuitable in design to meet the requirements. This explains why that, in England and Wales, the Swedish homes were distributed in small numbers to mainly rural areas (see the separate ‘Location List’ on the Prefab Museum website – if you can add to or update this list please let us know). They were described as ‘permanent’ but even so were given a life expectancy of only 60 years. Since then, “Many of these Swedish prefabs have been lost due to deterioration caused by climate, alteration, or demolition”(2) but many have survived beyond their 60 years and are still very valued homes today. 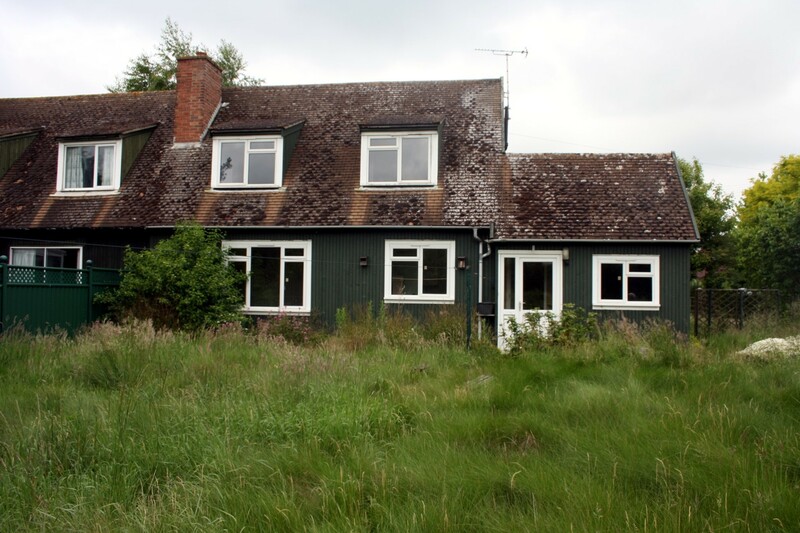 A pair of the bungalow style at Auckley, South Yorkshire, have been awarded grade 2 listed status by Historic England. In many recipient communities the homes are, to this day, reputed to have been a post-war gift from the Swedish government as a “Thanks” for our war effort. In fact, much evidence points to the costs involved both to the government and to the local area. The 1944 memo suggests that the cost of a house would be about £240 on import with a total of more than £7,000,000 being paid to Sweden. The total cost per house erected in this country was expected to be about £800. Reports of the actual number of Swedish homes supplied vary considerably, ranging from this 2,444 up to 5,000, depending on the sources consulted. This discrepancy might be explained if the latter figure includes the 2,500 allotted to Scotland in their 1945 first tranche. What is certain is that numbers never reached anywhere near the 30,000 first requested! They were exported flat packed to England and Scotland between September 1945 and March 1946. 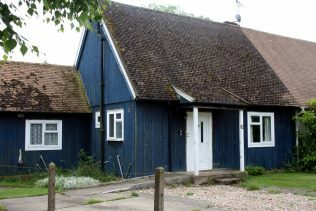 The first ones were erected at Abbots Langley in Hertfordshire, an event which made front page news as far afield as Australia with ‘The Townsville Daily Bulletin’ newspaper for Saturday November 3rd 1945 carrying a photo captioned, ‘Houses From Sweden For Use In England’, at the top of the front page. Immediately below is an article headed, “Hitler Suicided in Berlin”, an indication of the importance the editor placed on the house building programme! Besides being quicker to erect than standard houses, it was felt that the prefabricated design would require a less skilled workforce. In some cases the construction work was carried out by Prisoners of War who had not yet been repatriated. They were erected on pre-prepared bases with a brick plinth and services provided. The only other brickwork is that of the chimney stacks. The home itself was built from a timber frame which was clad in the prefabricated vertical tongue-and-groove timber panels which are double thickness with insulation in between. They have quite steeply pitched plain tile rooves, a feature which helps to identify surviving examples today and which are so very different from the ‘flat’ rooves of the urban prefabs. The majority were pairs of semi-detached dormer bungalows, with others being pairs of semi-detached houses. The front door is protected by a porch and opens into a spacious hallway. Off this is a dining room with an open fireplace and ‘French Window’ doors opening to the garden. Next is the Lounge which has a bay window overlooking the garden. A kitchen range and fire heated the hot water cylinder, concealed in a cupboard alongside, and a tub in the ‘wash house’. There is a further fitted cupboard to the left of the fireplace. A second door from the lounge leads to the kitchen with a larder and then into the ‘wash house’. This had a heated washing tub, a large deep sink and a practical tiled floor. Off the wash house is a WC, a store room and a coal house. The coal house could be replenished from an outside ‘hidden’ door with the coal being removed inside via the store room. 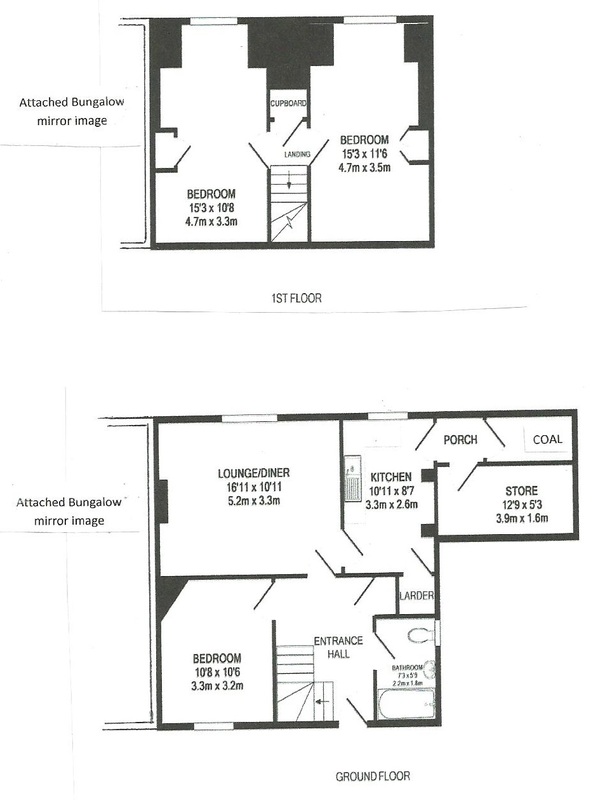 On the first floor there are three bedrooms and a bathroom/WC. 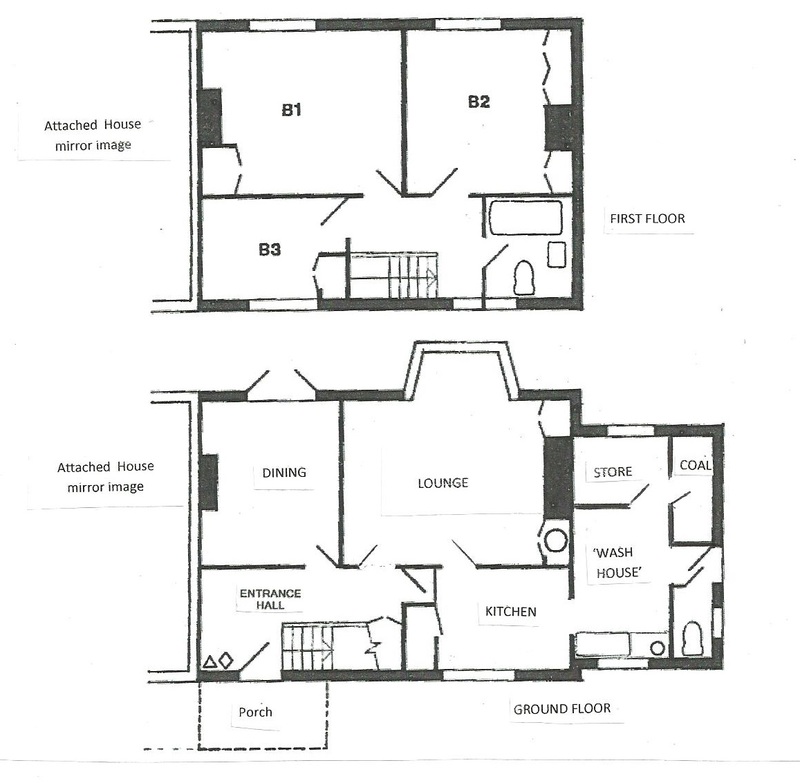 The two larger bedrooms both have full length fitted wardrobes. An airing cupboard takes advantage of the warmth from the chimney breast. 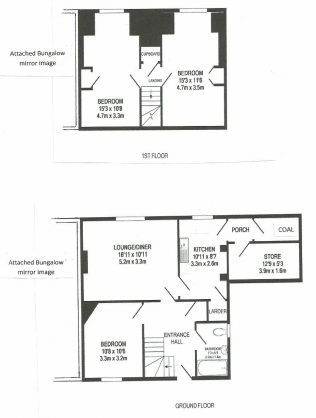 The small bedroom has a shorter fitted wardrobe over the stairs. Like the house version the front door of the bungalow is protected by a porch and opens into a spacious entrance hallway. 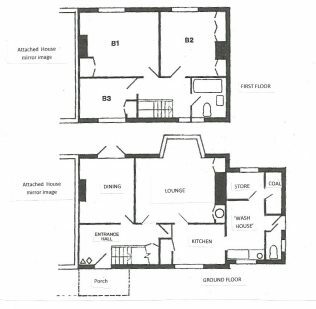 Off this on the ground floor are the bathroom, the living room (lounge/diner) and a smaller room which could act as a third bedroom or extra living room. 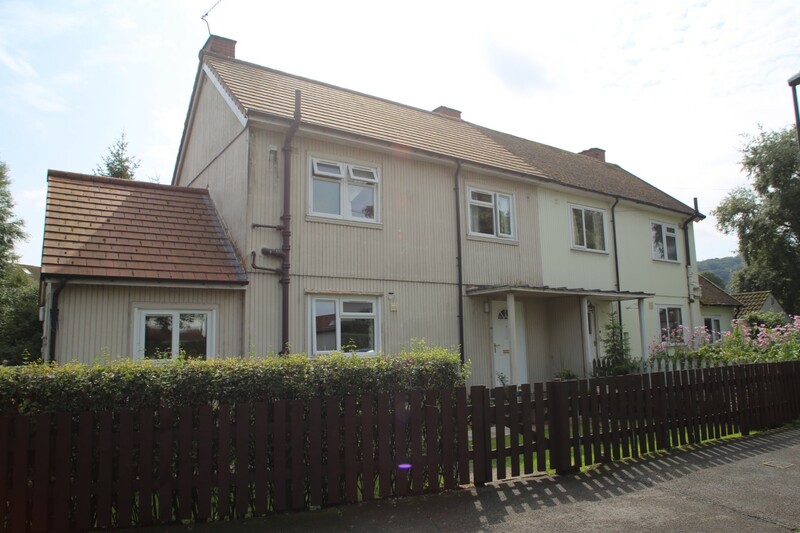 Like the houses, these bungalows also have kitchen, larder, store room and coal house. The stairway leads from the entrance hall to two first floor dormer bedrooms both of which have fitted wardrobes. In 1946 Pool was in the Wharfedale Rural District Council area. They, in common with Councils throughout the country, were trying to respond to the post-war housing shortage. A letter from the Ministry of Health to the Council was considered by their Housing Sub-Committee on 13 December 1946. It indicated “that the price to be paid by the Council for the timber sections of eight Swedish houses and the fittings supplied by the Ministry of Works will be £425 for the Type ‘A’ house and £375 for the type ‘D’ house.”(3) It was moved by Mr William Whiteley, Chair of the Sub-Committee, that the clerk be authorised to apply to the Ministry for sanction to raise a loan of £3,400 to cover the cost of the Swedish houses. The prefabricated sections were first stored at Otley before being erected along Mill Lane in Pool (O.S. Grid Ref: SE245453). In June 1946, “Mr Whiteley reported contract for erecting of Swedish houses from Wardman accepted”(4) at a total cost £7,674. It was decided that, “the rents of all the Council’s houses at Pool and Bramhope be increased to 8/3d per week as from the date upon which the first Swedish Timber House becomes occupied.”(3) This resulted in a letter protesting against the proposed increases being signed by twenty of the tenants in Pool. At the next meeting it was resolved that, “the letter be laid on the table”(3). I take it that this means it was ignored! They were officially opened on 3rd Oct. 1947, in a ceremony attended by Pool Parish Councillors. Originally they were simply addressed as the Swedish Houses, Mill Lane, but were later incorporated into Millcroft Estate when that was built by the W.R.D.C. between 1948 and 1949. All are still occupied today (2017). There is one pair of the semi-detached houses (33 & 34 Millcroft) and three pairs of the semi-detached dormer bungalows (5 & 6, 7 & 8, and 35 & 36 Millcroft). Nationally an important aim of the Swedish programme had been to provide homes in rural areas at least partially to house workers engaged in “agricultural and rural pursuits” (1). In April 1947 the Wharfedale R.D.C. had received a letter from the ‘West Riding War Agricultural Executive Committee’, asking for information as to the number of individual applications for council houses that they had received “from Agricultural Workers and for the number of new houses proposed to be allocated for the use of Agricultural Workers.”(3) The Council replied that they were not aware of any such applications and that they had no plans to designate any of the houses being erected as solely for Agricultural Workers. In fact the majority of the original Millcroft Estate residents were not employed in farming but, like my father, in the paper mill operated by B. S. & W. Whiteley Ltd. on the outskirts of the village. It was presumably in response to this reply that a Mr Calverley, representing the Ministry of Agriculture and Fisheries, attended their July 1947 meeting with a letter from the Minister “stressing the urgent need for more agricultural dwellings”(3). 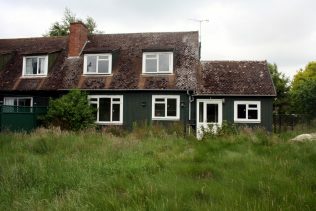 This time they resolved to instruct a surveyor to report on possible sites for agricultural cottages and to place an order for eighteen Airey Rural Houses. My parents, Robert Al”fred” and Louisa Midgley, met whilst serving with the R.A.F. They married in 1946 and, like many newly-weds unable to find a home of their own, had no choice but to move in with my father’s parents. This arrangement continued until they became the first occupants of number 25 Millcroft Estate, a newly built standard brick council house, on 7 February 1949. 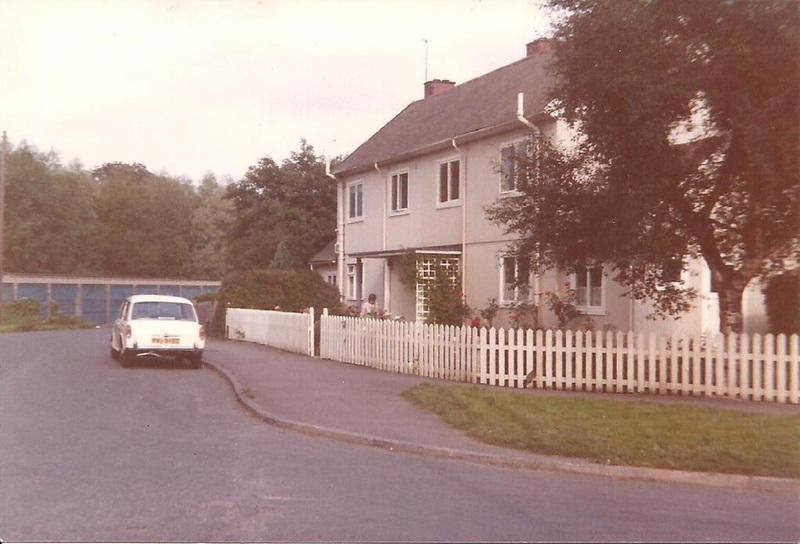 However, the Swedish houses were held in such high regard that when, in the early 1960s, the opportunity arose they asked the Council for a move down the street to number 33. The timber houses were considered to be more spacious, better equipped, warmer, and so cheaper to run, than the standard house. In the summer of 1972 they were able to buy no.33 from the Council at a price of £1,320 and it remains in the family today. In Scotland the styles of the timber prefabricated homes are quite different. 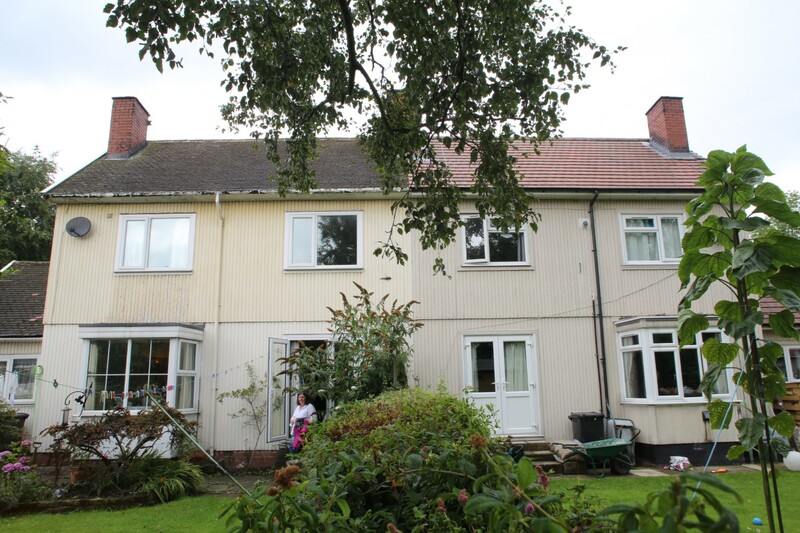 At least six different designs of houses, without the single storey wash house extension, were erected in pairs of semis or in terraces of 4 or 6. This may be partially explained by the fact that, as well as those from Sweden, some were imported from Finland. At the moment our location list does not distinguish the origin but it may be something we are able to do in time. The distribution policy also seems to have been very different from England and Wales. 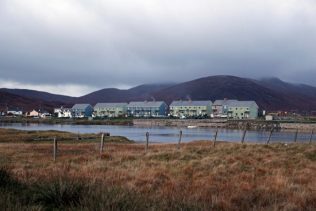 Some of the homes were allocated in small numbers to rural locations, including the Isles of Orkney, Shetland, and several of the Western Isles. In addition, a different style of bungalow was provided for its workers by the Scottish Forestry Commission on a number of its plantations. However, by far the majority in Scotland were erected in larger estates within towns and cities. Two estates of 50 homes each still remain In Edinburgh (in the West Pilton and Sighthill areas). An even larger development remains in the Balornock area of Glasgow. Thus it seems that whilst there are fewer locations in Scotland, there are far more actual homes than in England and Wales. However, progress on fulfilling that initial order does not seem to have gone well and was still incomplete in 1949. (1) Memorandum from the Minister of Reconstruction to the War Cabinet, entitled, ‘Prefabricated (Permanent) Timber Houses From Sweden’, dated 14th December 1944. (3) Wharfedale Rural District Council, Housing Sub-Committee minutes held by the West Yorkshire Archive Service, Leeds section.